When I was a kid, a 1956 Chevy truck had captured my heart and imagination. I talked about it incessantly and saw it daily during the school year as the school bus drove by the vacant lot it sat in. Then one day it was gone. The hole it left in the vacant lot was noticed by every kid on the bus and it was all we could talk about for the next half hour. As the bus rumbled to a stop near my driveway, the mystery was suddenly solved. There, in my yard, was the rusted hulk of that wonderful truck. Over the next few years, my father and I worked on that truck every spare hour we had and he always referred to it as “my kid’s truck.” When I graduated from high school, I was the proud owner of a completely restored 1956 Chevrolet 3100 Pickup. We rebuilt, replaced, polished and perfected nearly every square inch of that old truck. We not only made the noticeable outside parts of the truck into eye-candy, but we also took pride in the details that most people don’t notice. For instance, my Dad knew that the inside of the cab had to look just as shiny and sharp as the outside of the truck and the parts under the hood. That meant we rebuilt the dash components, put new headliner in and when it came to the carpet in the cab, my Dad was insistent that we get a carpet kit from Tuckers Classic Auto Parts. We bought a lot of parts from Tuckers over the years and were never disappointed with any of the parts we put in that truck. So, when it was time for the finishing touches, we knew we would get a great deal and quality carpet that would fit perfect. What About That Old, Grungy Carpet? One weekend we took the bench seat out of the truck, scraped and sanded the old “glue ridges” that were left on the floor of the truck because the old carpet was just gone, sealed the entire floor with a primer, and we were ready for the new carpet kit. Tuckers Classic Auto Parts has carpet for 1956 Chevy trucks in stock colors that Chevy made, plus other colors that make it easy for you to get the same color as the truck itself, or a good contrast if that is what you want. With over 10 colors to choose from and perfectly fitted carpet kits for the different styles of truck; for example, carpet for a three-speed automatic is a little different fit than the carpet to fit in a four-speed 4×4. Also, the carpet kit for the four-speed 4×4 High Hump is cut differently than the regular four-speed 4×4. The kit you get for the truck you have will fit perfectly and will look as good as the day that truck rolled off the assembly line. My Dad and I installed a Charcoal Gray carpet kit that contrasts beautifully with the turquoise paint job on the exterior. Tuckers offers carpet kits that fit the exact make, model and year of your truck. A good carpet kit can make your truck’s interior look and smell new, and give it a plush look and feel. Remember that every time you get in your truck, you take outside elements like snow, dirt, and mud into the cab and onto the carpet. Even if you are strict about not eating or drinking inside of your newly renovated truck cab, accidents still can happen with spills and stains. With a good carpet kit, if damage occurs you can replace the entire thing for a fraction of the cost of having it installed by a professional installer. The detailed instructions that come with each kit will carefully walk you through each step of the installation and you can take as long as you need to get it right. When you use a quality carpet kit, you will be your own professional. 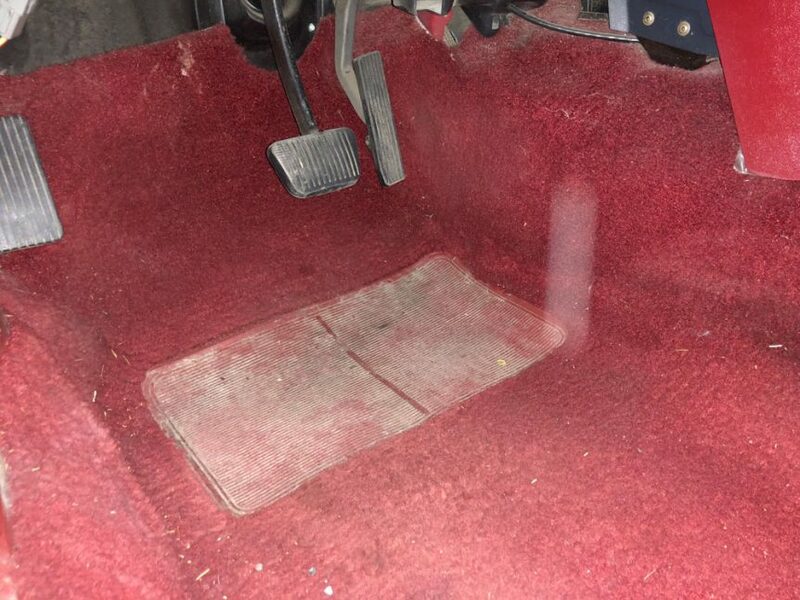 Do not forgo the chance to replace your carpet kit once you feel that it’s time for your truck’s interior to come alive again. If you are looking to customize the interior cab of your Chevy pickup, or just want to replace your old worn carpet, a carpet kit from Tuckers Classic Auto Parts is the ultimate answer.